We've followed Flo and her friends from the diner to the farm, through the perils of opening your own valet business, and into the fast-paced world of fashion. 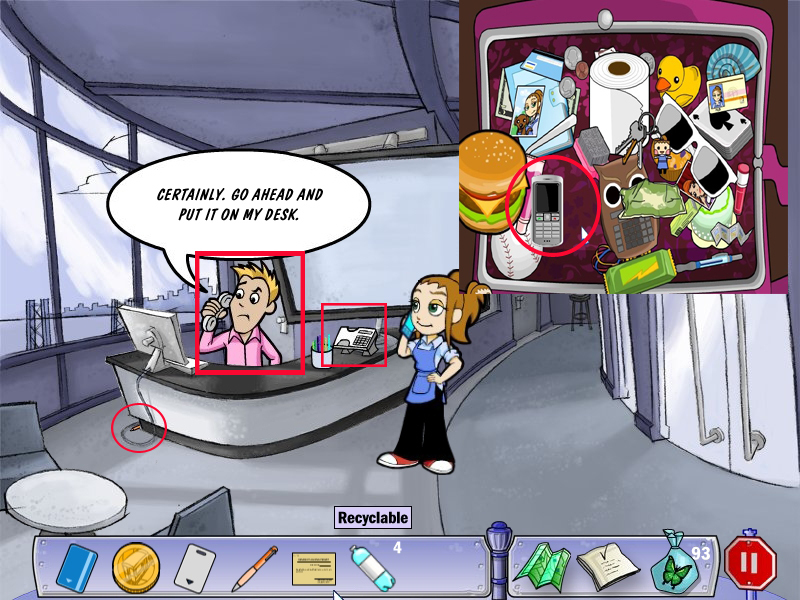 Now Flo and PlayFirst are entering new territory in the first adventure game from the Dash franchise, Avenue Flo! Avenue Flo features everyone's favorite waitress as she tries to help her fellow business owners salvage what could be the biggest wedding Diner Town has ever seen. Tony and Vicky are finally getting married! Maybe. Quinn of Wedding Dash fame is at her wit's end. The rings are missing, the cake has gone bad and all of the butterflies have flown away. 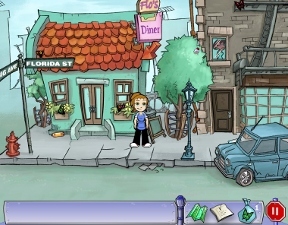 Flo quickly springs into action and hits the streets of Diner Town in search of answers. First on Flo's handy to-do list? Track down all 99 escaped butterflies. Luckily, the neighborhoods you'll need to explore are covered with the colorful little scamps. Unluckily, that's the easy part. That list is getting longer by the second, and in order to get this wedding back on track, Flo will need to stay sharp and put her detective skills to the test. Simply point-and-click to send Flo in the right direction or to interact with some familiar faces. The controls and the gameplay couldn't be more intuitive, and the smooth interface ensures that you won't waste time figuring out what to do next. If you get stuck, check the map or that helpful list for assistance. 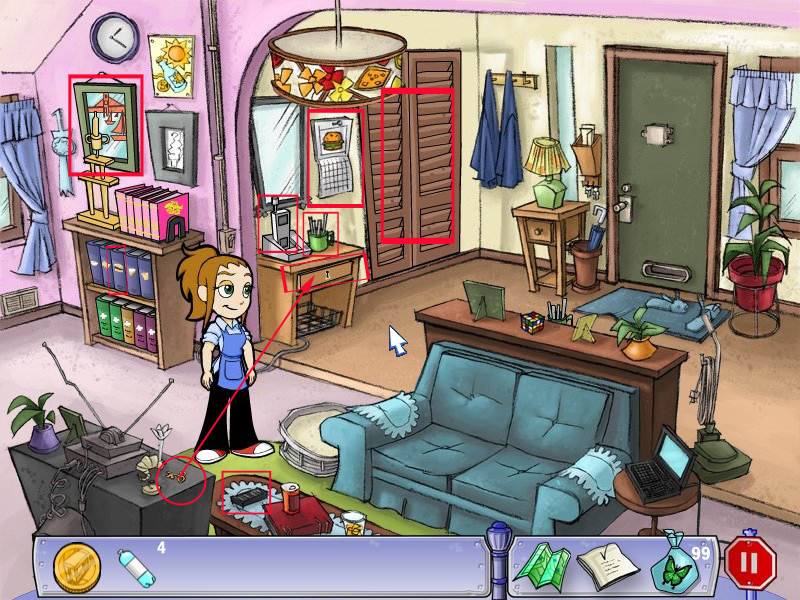 While there is a small hidden object element to the game, the majority of play is given over to puzzles, which are quite well done. The plot is geared towards the most general of casual gameplay fans, but, in a surprising and welcome choice, PlayFirst wisely stays away from the expected staples of the casual genre, such as match-3. Logic squares, spatial reasoning and pattern recognition are the order of the day here. 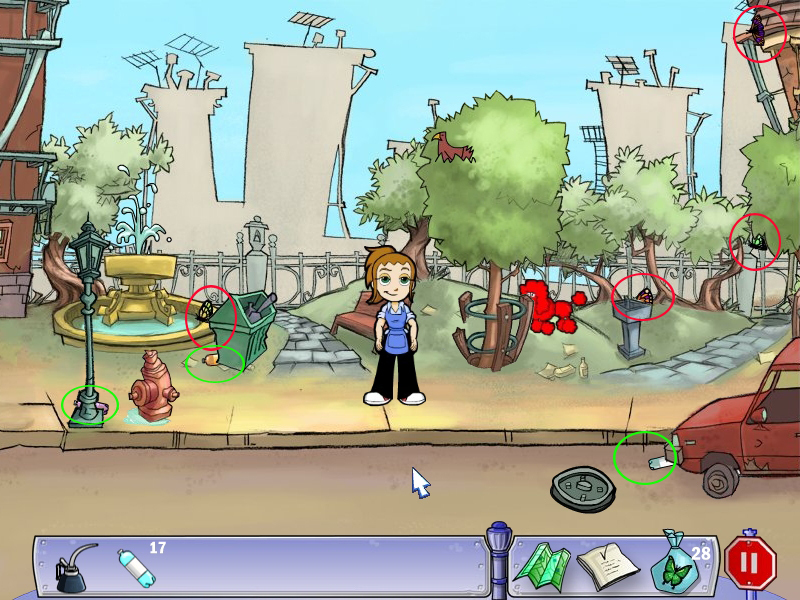 Analysis: Avenue Flo is a refreshing entry in the adventure game genre. The humorous and quirky aesthetics established in the myriad of Dash sequels and spin-offs serve the franchise well. The graphics are bright and crisp, although the sound effects aren't quite as good as the art. Flo is, as always, as cute as a button in her well-worn apron and sneakers, and it's a pleasure to see her away from the world of time management. In addition, she actually speaks (and sings) here for the first time, and the voice acting is above average. Experienced gamers may find that there's too much hand-holding and not enough free play, but the overall quality of the game is substantial enough that the linear plot and direction can be overlooked. This being said, when the game hits a wrong note, it's very disappointing. A rhythm puzzle has Flo teaching an aerobics class, which normally would be opportunity for extreme cuteness or at least a good laugh. Unfortunately, the execution of said puzzle is sub-par, especially in comparison with the rest of what the game has to offer. First of all, and this may just be my personal bias, I dislike playing these kind of puzzles with the mouse. I find keyboard controls much more precise. Issue the Second: For an aerobics class, one would expect Flo to take it on down to funkytown, musically speaking. Nope. There's music playing, but the songs don't match up to the puzzle cues. This means there's no audio guidance. For a rhythm game. Which is just lazy, especially when the game has a jaunty original theme song. This, though, is only a slight flaw in an otherwise polished game. One of Flo's chores is to finish the beading on the wedding dress. You're given the pattern and are able to see the order the beads will appear in. To complete the design, the beads must be sewn in one continuous line, so you need to plan several steps ahead to succeed. 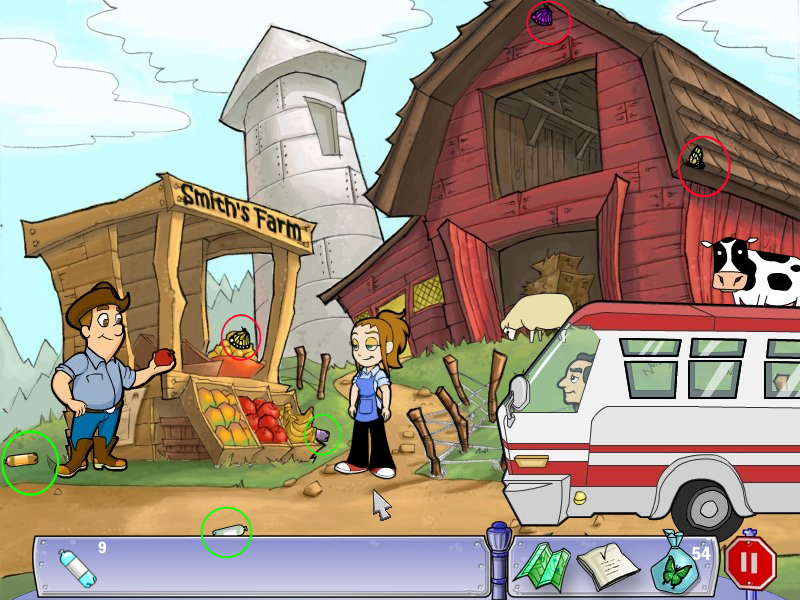 While the mechanics of the puzzle are simple, the presentation and difficulty involved are not, and the game manages to stand out among the plethora of adventure and hidden object games currently available. Avenue Flo is a welcome addition to the DinerTown series! Avenue Flo Walkthrough now available! Bottles and butterflies are only outside the buildings. On the screenshots all butterflies are marked with a red circle, all bottles with a green circle. You can walk around and choose any direction and any building you want, just be aware, that some things might not work out before you haven't done others. To see where you have to go, you can use the map, located at the bottom left of your screen. Each neighborhood will show you another map, telling you where you have to go and what you might have done there already. All tasks are shown on the to-do-list, the right side of the bottom bar. Don't get worried, when you can't fulfill a task at once. You will often have to do other things first, before you can finish one goal. 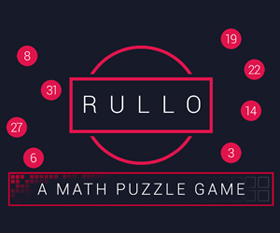 Some of the puzzles provide a hint or a reset-button, but not all. After this, collect 3 bottles, laying around. You will need them later. Recognize the red bottle, stuck in the tree. Knock at the door of the house right next to it. Diana tells you, that she can't help you, as the window in the upper floor is stuck. You will need to find oil. Collect 4 more butterflies and walk to the right. You can talk to Greg and Herb again, but there is nothing important. Collect 6 butterflies and 2 bottles. Find the 12 parts of the beads. They are all in this room. Talk to Bobbi again and find the screwdriver (located on the table bottom right). Click the bead machine and use the screwdriver to unscrew all four screws. Go back and talk to Bobbi again about the code. Geht the paper from the floor far middle - it says the code is 102030. Click the machine again and give in the code. Press the enter button. Get the beads out of your inventory and click them onto the bead machine. Your goal is it to fill the pattern with the beads in the tube. Click on the pattern according to the next pearl, that will come out of the tube. By doing this, you will see a line between the pattern dots. You can not cross any of these lines. You can reset the whole pattern by using the according button. The hint button shows you your next move or shows you how much you might have to go back. By clicking the last pearl you placed, you can undo your step. You can do that as often as needed. You will have to do four different pattern. Please have a look at the screenshot to see all four solutions. There are more beads needed, but leave Bobby for now and walk right. Collect 4 butterflies and 3 bottles at the crossing and go 2x left. Talk to Aunt Ethel - she has pearls, but needs a wire cutter for it. Collect 3 bottles and 5 butterflies. Go 1x left and stop at the subway station. Collect 3 butterflies and 3 bottles. Talk to Derek and try to grab the oil can standing left next to him on the ground. You can't borrow it and you know now, that you will have to get coffee for him. Collect 3 bottles, 5 butterflies and enter the Pet Spa. Talk with Walter - you will have to find Snookums and dye remover - both will be added to your list. 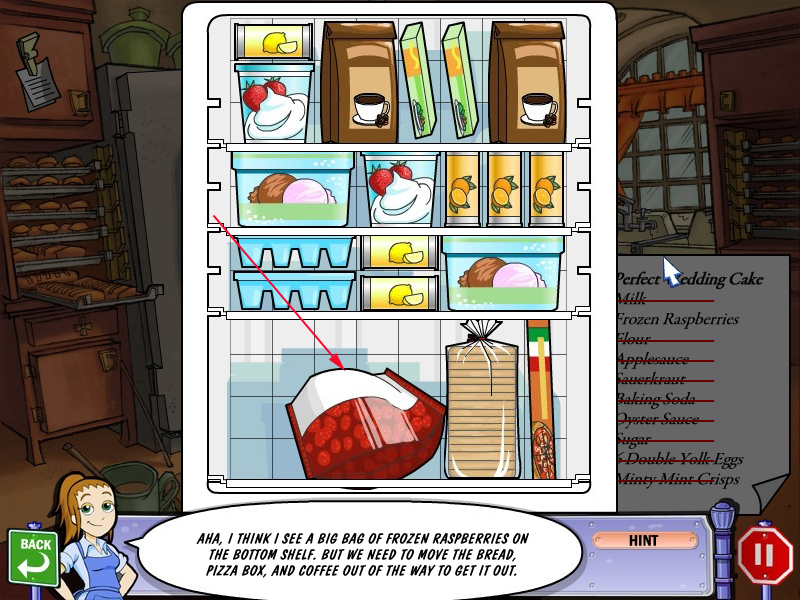 Go back to Flo's Diner and click the coffee machine to get a cup of coffee. Go back and give the coffee to Derek. Ask him for the oil can and this time he will be happy to give it to you. Walk to the right 1x. You will see Snookums at once. Click him three times - each time he will run away. Addition on your list: You need to find some, that will lure Snookums. Collect 4 butterflies and 3 bottles. Walk completely to the left and enter the Pet Shop. Click the Dog Treat - Vendor left side and go on talking with Cassie, till you can ask her to bake a cookie, Snookums will like. Click after this the boxes to activate a mini game. You will be given a box and a few items. Place all items in the box, so that all fields are filled, but they cannot overlap each other. To see the solution for all four boxes, please have a look at the screenshot. Leave the house and walk back to the park. Click the dog treat on Snookums. It will fall on the street. Do not click Snookums, just wait and see what happens. Now go 2x left and enter the Beauty Shop. She needs red dye, has dye remover but wont give it you, before she does not have her red dye. Leave the shop and walk back to the diner, but do not enter. Knock at the door of Diana's house and give her the oil. She will walk upstairs and you will get the red bottle. Give the red dye to Betty. Click the drawer at the round stand in the middle. The drawer opens and you will get a nearby look. 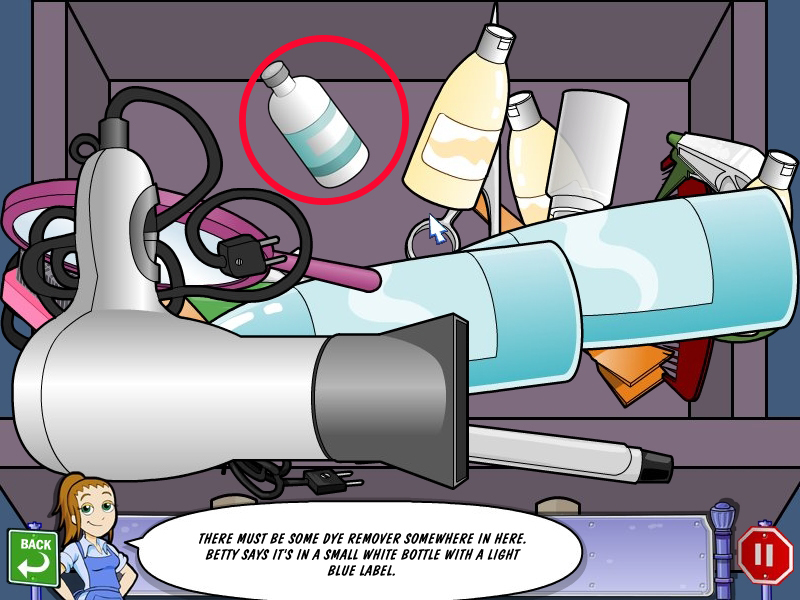 Drag and drop all items, till you found the little bottle with the dye remover. Leave the shop and go to the right. Give Walter the dye remover. After the cut scene go back into the shop. Talk with Walter and ask him for aunt Ethel's wire cutter. You will find it under the right sitting pillow of the couch. Leave the shop and go back to see aunt Ethel. Get the wire cutter out of your inventory and give it to aunt Ethel. She will give you some beads. Go back to the Dress Shop. Click the beads at the bead machine and make the last four pattern. To see the solutions for all four pattern please have a look at the screenshot. Now you need to find some lace for the wedding dress. Go and see Bettie at the Beauty Shop. Talk to Bettie and click on the curtains. You can have them, but you need a long pole. So back to Bonnie at the Dress Shop. Click the long pole right next to Bonnie. You may have it, but first you will need to arrange the clothing display. Click the back wall and a mini game will open. 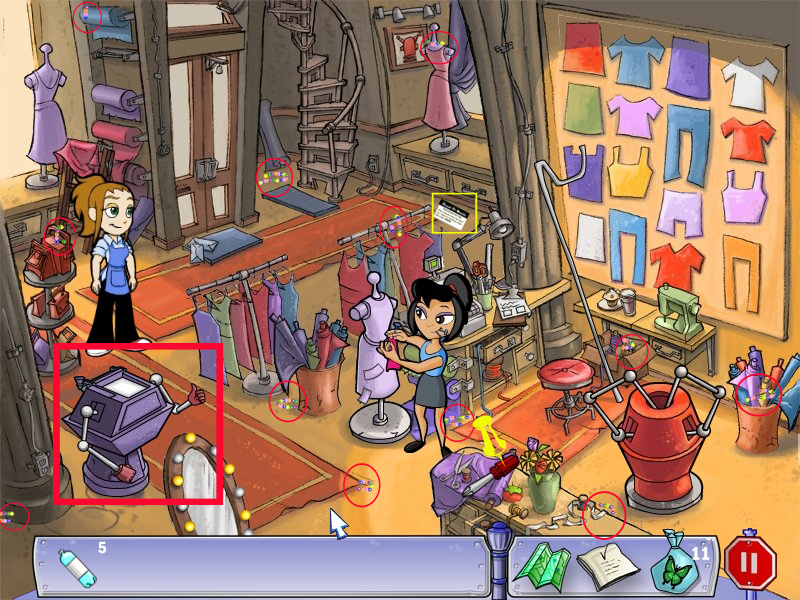 You have to place the clothes so that every item has a different type and color next, above and below. Shirts not to shirts, red not to red and so on. Swap items by dragging the one you want to replace to the place you want to have it. It will automatically change place with the one hanging there. For the solution of all five displays please have a look at the screenshot. Get the pole and leave the shop. Go to the Beauty Shop, click the rod at the curtains and you will receive the lace. Go back the Dress Shop and hand out the lace to Bonnie. Congratulations - you solved the first part of the wedding rescue. You will find your self outside the Dress Shop, go to the subway station, located between Beauty Shop and Pet Shop. 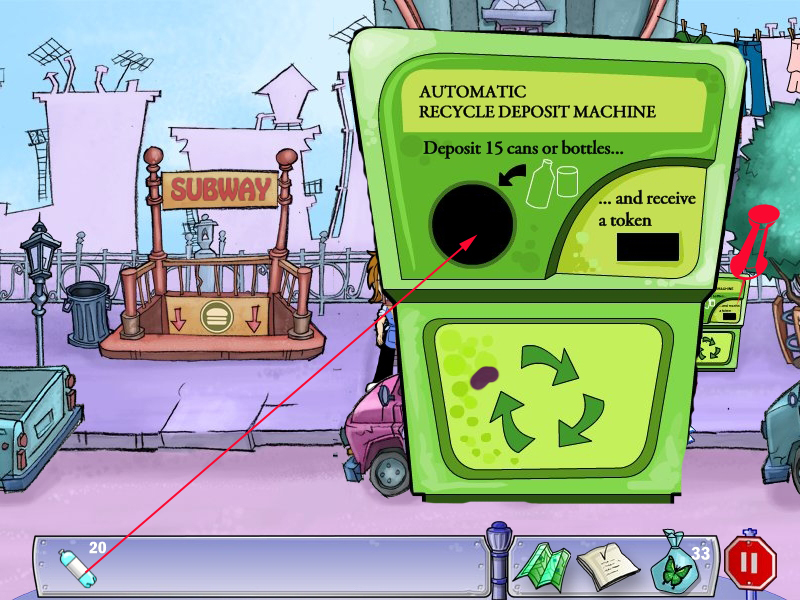 At the right side, you can see a recycling machine. Click it to get a nearby view. Grab your collected bottles from your inventory and click them on the machine. For 15 of them you will receive a token for the subway. 5 will go back into your inventory. Go down to the subway and click your token at the barrier on the right side, where the train is standing. When the train arrives, go upstairs. Collect 4 bottles and 5 butterflies. Talk with Milo and go 1x right. Collect 6 bottles and 6 butterflies. 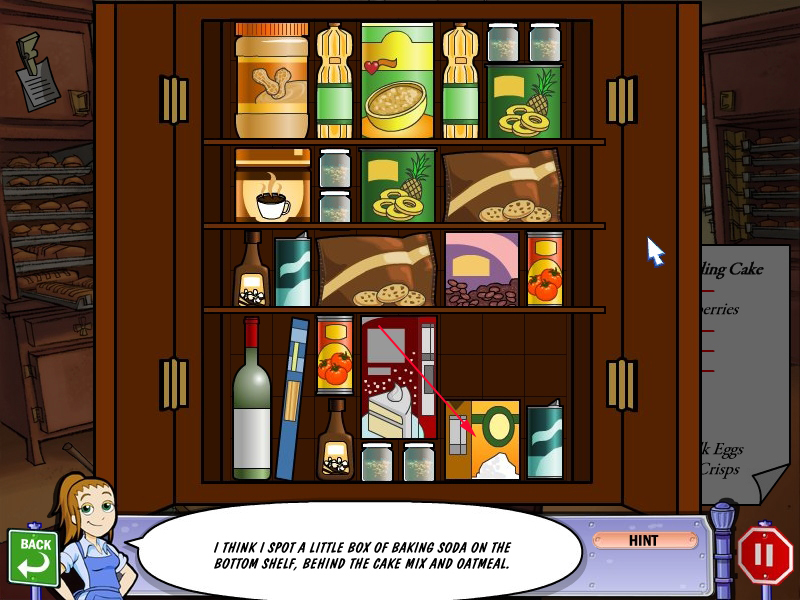 Take with Stella, then find the recipe box. It's the turquoise box bottom right, half hidden by the coffee display. Click it and a mini game opens. You need to rearrange the left pattern on the right side. 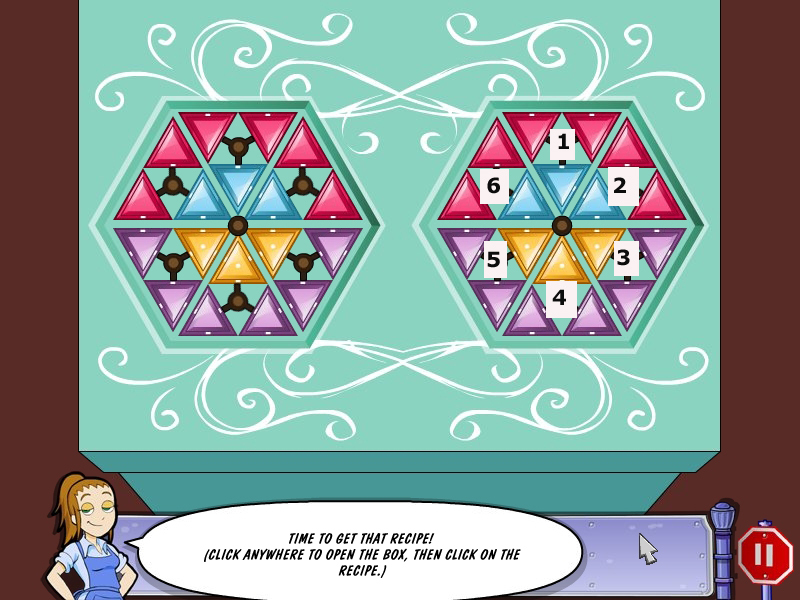 To do so, you need to click the buttons in the middle of each triangle and/or the buttons in the middle of the shape. When you have the feeling to be stuck, leave the game and come back - it will reset and start in the same position as the first time. There are for sure a lot of ways to do it, this is the way I made my way. I numbered the buttons from 1 - 6 starting at the top (please have a look at the screenshot), middle is middle. Click anywhere to open and click the recipe to get it. Talk to Stella and enter the kitchen in the back of Stella. You will need to find all ingredients in the kitchen counters. 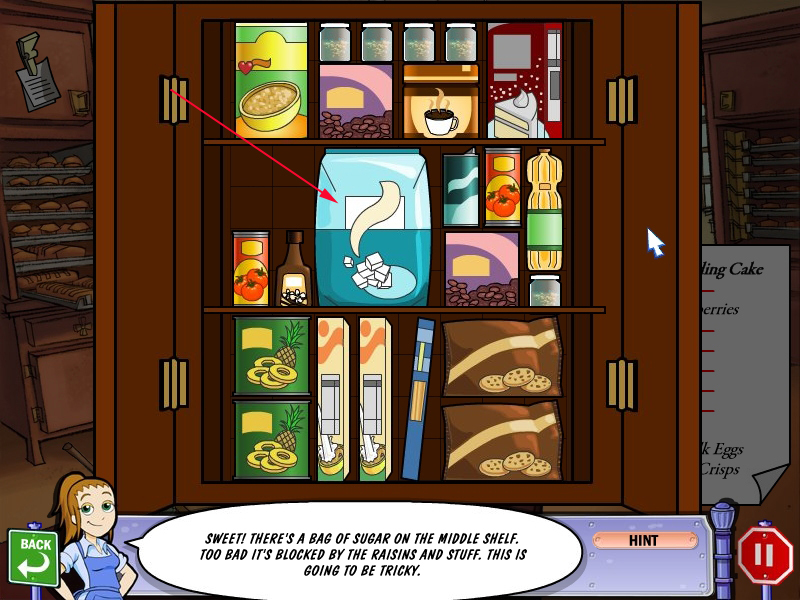 But all of them are hidden behind other items, so you will first have to find them and then get them out of the shelfs. Please have a look at the screenshot to see the final picture. 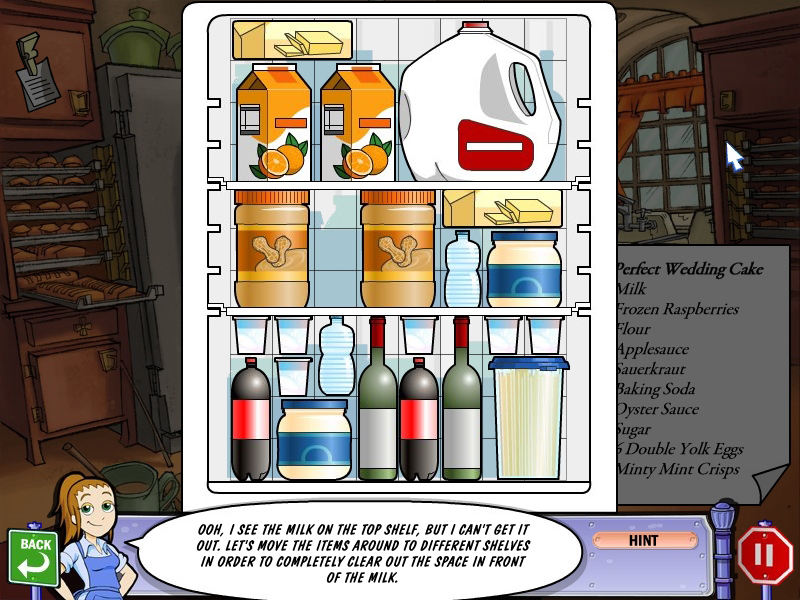 Rearrange all items, so that you can get the milk out of the top shelf. Apple sauce - bottom kitchen counter, fourth from right. Baking soda - upper kitchen counter, fourth from right. Oyster sauce - upper kitchen counter, third from right. Sugar - upper kitchen counter, second from right. Frozen raspberries - freezer, left door next to fridge. Click the kitchen counter top left and read the note. You will have to find double yolk eggs and crisp cookies somewhere else. Leave the kitchen and talk to Stella. You will need to go to Smith Farm to get the eggs. Leave the bakery and go 1x right. Talk to Frank the fireman. Collect 5 butterflies and 5 bottles. Go right and collect also 5 bottles and 5 butterflies. Talk to Ernie, the bus driver. He lost the nuts for the spare tire. Find the 10 nuts, laying every where in this scene. Give the nuts to Ernie. Walk all the way back to the subway station and exchange your bottles for a token. Go back to Ernie and give him the token - he will bring you to Smith Farm. Enter the barn and talk to Helga. Click the button, to go to the field. You will have to find the 8 chickens belonging to the chorus. In the right upper corner you will always see the chicken you are looking for. Drag and drop the other chicken, till you found the right one. Click the "continue" button at the bottom left to get the next group of chicken. When you found all eight chicken, you will be brought into the barn. The chicken will sing a song. By pressing the play/pause button at the low left, the chicken will stop to sing. 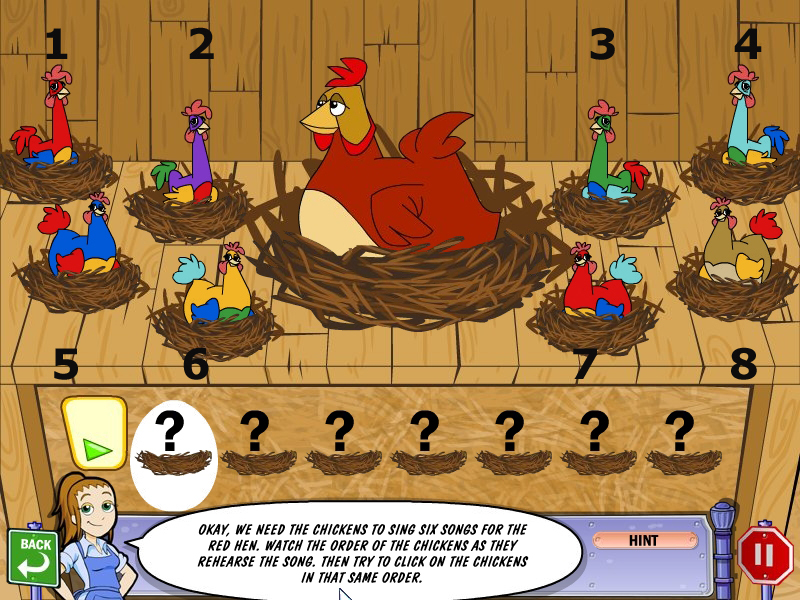 By clicking the chicken, you can start the sequence. Press the play/pause button again and the chicken will start from the beginning. Stop them again, to write down or click the next chicken and let them start singing their song again. When you filled in the complete song, Helga will lay an egg. I numbered the chicken from 1 - 8, starting top left, ending low right. You will have to repeat 6 songs. Talk again with Mr. Smith and leave the farm by bus. When you are back, go 1x left and follow then the Sunnyside Road till the end. Talk with the Sprout Girls. Drag and drop the items in your purse till you found two $5-bills. Click the girls to give them the money. Now you will have to collect their money. You will receive you box of crispy mint cookies. Go back to the bakery. Go into the kitchen and drop the cookies and the eggs into the machine. To see how it is working, you will need an instruction video. Click the third drawer from right. Drag and drop the items till you find the tape. Leave the bakery and go back to Sunnyside Road, stop at Jo's Fitness Center. Enter the Fitness Center and talk to Jo. Click the people in the back to do aerobics with them. On the top you see moving buttons, at the end a circle. Click the color of the button on the big circle, when the moving button reaches the circle. For a great moment, you will get 15 points, for a good moment 10 points. You will have to meet the point goal, you see at the bottom left. You will have to do this 6 times. Click the video tape at the VCR recorder right next to the aerobic class. 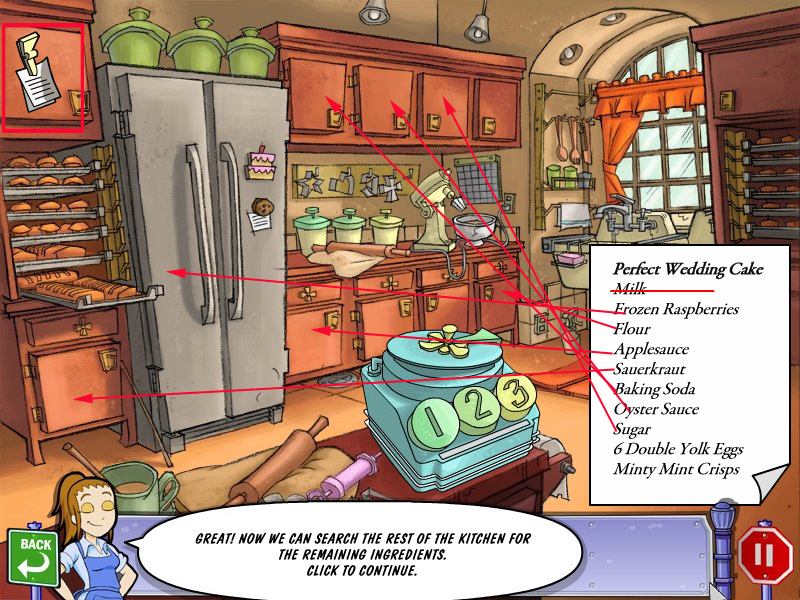 The code for the baking machine is 1122332211. Go in the kitchen and enter the code into the machine. The cake will come out. Congratulations, you solved the second part of the wedding - rescue. Go back to the subway station. Exchange your collected bottles for a subway token. Go down and use the token to enter the subway. When you reached the other station, go upstairs. Collect 7 butterflies and 3 bottles. Talk with Hal and find out, that you will need a permit from Big Corp. to pass to the left. Recognize the anchor and the shipping wheel at shop. Talk with Ernie - recognize that he is having a newspaper stand, called Daily News Scoop. Collect 7 butterflies and no bottles. Recognize the crab on top of the house next to the Flower Shop. You will be brought to a mini game. Your goal is it to make the bouquets exactly like the rules from Miss Big say. When you think, you did it right, press the "Check Bouquet"- Button. When you followed all rules, you will be given a "continue"-button to press for the next bouquet. To place a flower click it on the top left and click it again on the pattern right side. To change a flower type or color just click the flower you want, it will change your flower. To remove a flower from the bouquet just click it. For most of the bouquets different solutions are possible. You will have to do 6 bouquets. Please see the screenshot for my solutions. Talk to Marco and go to see Bernie at the Newspaper Stand. He is out for lunch so head back to the subway station. Exchange your bottles at the machine. This time you will receive a gold token. There is no need to collect bottles anymore, as with the gold token you will have unlimited access to the subway station. Go down and use the train to Avenue Flo station to see, if Bernie is in Flo's Diner. Leave subway station after arriving an go to Flo's Diner. Click Bernie and a cut scene will start. After grandma locked up the rings, go back to the subway station and choose Pancake Avenue Station. Move right at the Newspaper Stand into the Gravy Boat Way. You can collect the bottles, but you do not have to, there is no need for them anymore. Talk to Simon and learn, that he landed a regular part as a doctor in the daytime drama "Hospital Blue". Walk all the way to the left, till you stand in front of the Big Corp. Recognize the seahorse in front of the building. Before she is giving you an elevator card, you need to let sign 5 employees Mr. Big's birthday card. Enter the door to the right. You are in kind of a maze - to move, click the arrow of the direction you want to go to. Give the card to the employee to sign. Use the door to leave the office. Give Tina back the birthday card, for this she will give you the elevator card. Use the card with the elevator left next to the office door. Go left and click the computer woman. You will have to answer questions to proof that you are really a resident. Click the monitor to start. Read the question and click again, you will be given three possible answers. Click the one, you think it is right. You next question will appear. The result you will get at the end of the test. When you failed, you will be given the amount of wrong answers, but not which answers have been wrong. For some of the questions you might have a look at the map or your to-do list to find answers. For some you just might have to go back to a location to find out, when you can't remember. You can redo the test as often as needed. Q: What is the construction worker's name, who said, you need a permit? Q: What is the name of the news stand in your neighborhood? Q: What is the name of the bookworm who runs the stand? Q: What's the name of the road, leading to the Cruise Ship? Q: What is the name of the drama Simon recently got a part of? Q: What creature is in the fountain in front of Big Corp Tower? Q: Which of these items is NOT outside of the nautical shop in town? 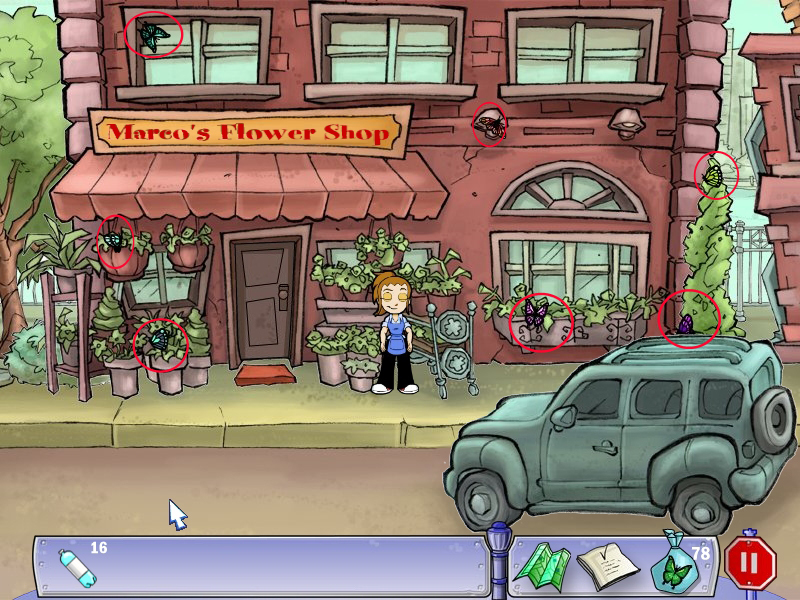 Q: What animal is on the sign of the building located Marco's Flower Shop? Having all answers correct, you will receive the permit, but it still needs a signature. This will be done on 50th floor. Leave the office and talk outside with Barb. For the 50th floor you will need a blue elevator car. You can have Barbs, but first have to bring her 10 mugs. Enter the office at the right. You are in a kind of maze again. 1x up, 1x right, 1x up - use the door to leave the office. Give the mugs to Barb, you will receive the blue elevator card for it. Use the blue elevator card to reach the 50th floor. Enter the door left saying "Signatures"
At the right left side of the desk on the floor you can see a orange pen. Try to talk with the guy behind the desk, but he is too busy with telephone calls. Click the telephone at the right side of the counter. A mini game will open. 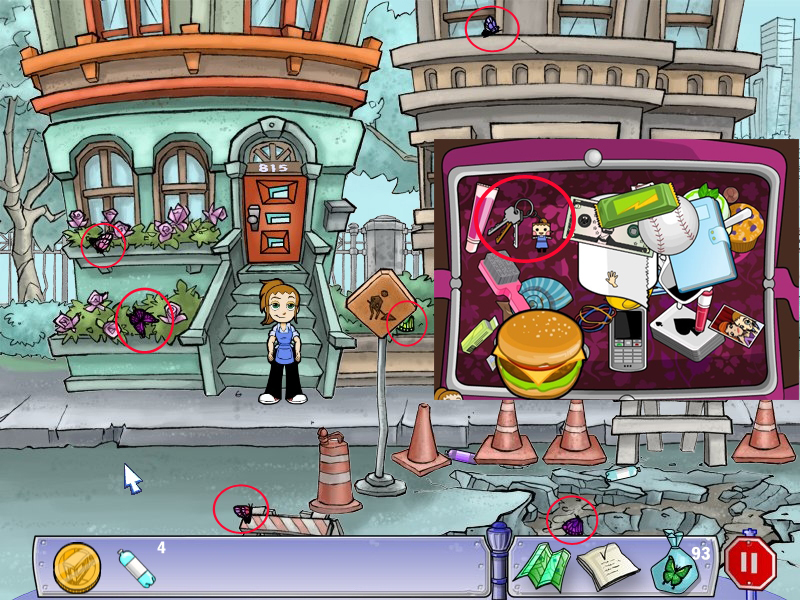 Just drag an drop the items in Flo's bag till you find her cellphone. Talk with the guy and give him first the permission, then the orange key. You will also need a stamp. Enter the office at the left. First of all you will have to find the secretary. 1x right, 1x down, 1x left, 2x down, 1x right, 1x down, 2x left, 2x up, 1x left, 1x up, 1x right, 2x up, 1x right. You will have to find the scraps of the memo, copy it and bring it back to the secretary. Click the scraps onto the copy machine and bring copied paper to the secretary. 1x right, 1x down, 1x right, 1x down, 2x left, 2x up, 1x left, 1x up, 1x right, 2x up, 1x right. Give the paper to the secretary, she will stamp your permission. You will find yourself in front of the Big Corp Tower. Go to the subway station and give Hal the permission. Now you can go to the left. Collect your last six butterflies. Enter the left house - you will have to look for the keys in Flo's purse first. Drag and drop the items around, till you find the keys. Click the table drawer under the mirror in the middle back to learn, that the drawer is locked. Get the key from the televion in the low left corner. You will find a paper, but it is written with invisible ink. You need to find the revealing pen. Click the pen holder right next to the phone. Move with the pen over the paper, which was kept low right corner. Clue: Grandma's birthday - click the calender above the phone. Grandma's birthday is the 6th. Clue: Quinn's shoe size - click the closet right next to the telephone table and click the shoes. Quinn's shoes show size 6. Clue: WDTN - click the tv remote on the table in front of the couch. WDTN has the channel number 4. Clue: Dial Darla - click the phone - Darla's short dial is the 2. Clue: Sailboats - click the left picture, right next to the window. There are 7 sailboats to see. 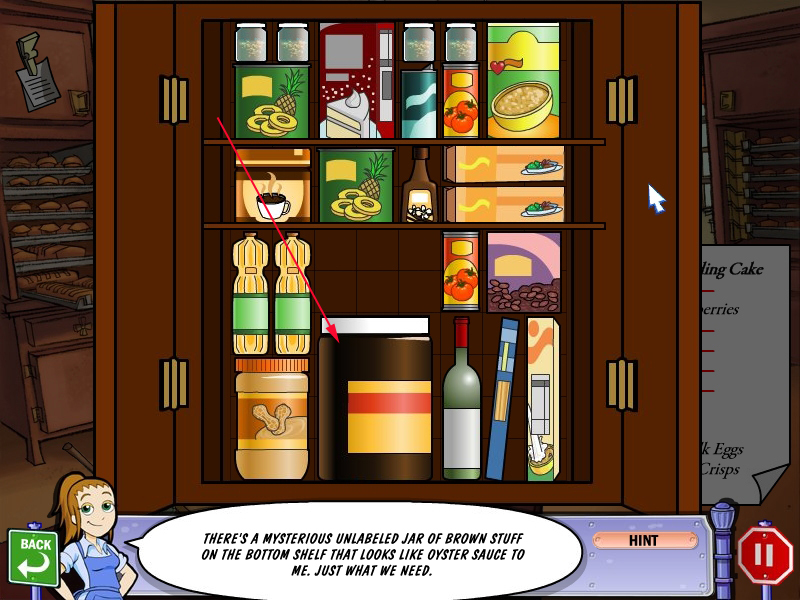 Clue: Burger Bonanza - click the book shelf underneath the pictures - Burger Bonanza is the 3rd book. Head back to the subway station and to Flo's Diner. Click the safe and enter the code. Now go back to the subway station and drive to the Cruise Ship. Talk with Bernie, then click the cruise ship to enter. Swap pieces by clicking them till the pizza shows a hidden note. Pieces in place can't be swapped anymore. Another cut scene follows and a very last time you have to save the wedding. You need bring the dough to the green round target. When you want to move Flo, click the square you want her to go. When you want to move the dough or a table, you need to click the object. It will always move in the direction, Flo is looking at. With the reset-button you can restart the level. Please have a look at the screenshot for all solutions (different solutions are possible). Congratulations! You saved the Wedding! Thanks to Kayleigh for writing up such an awesome walkthrough!! \o/ Wooty-Tooty! Absolutely fantastic game! 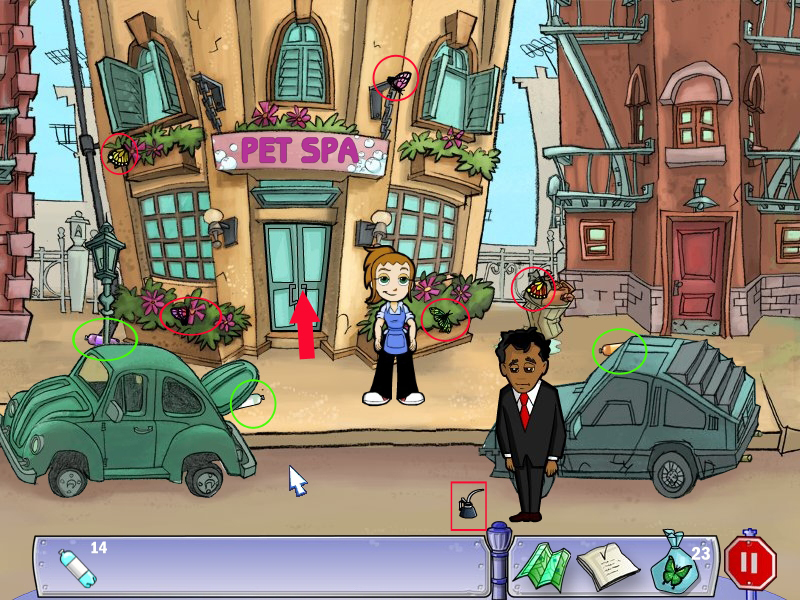 Iv'e never liked the Diner Dash Series, nor the Diner Town Tycoon or Diner Town: Detective Agency games. This is the first game pretaining to the world of Diner Town that I have ever enjoyed, and what a game it is. Although some people may be turned off by the cartoon graphics or semi-simplistic item hunting, others will commend this game for its tounge-in-cheek story (which I feel was very well executed), as well as its charming visuals and superb voice acting. Sure, it may have some cheezy jokes every once in a while, but the voices of the characters in Avenue Flo have really done a fine job. 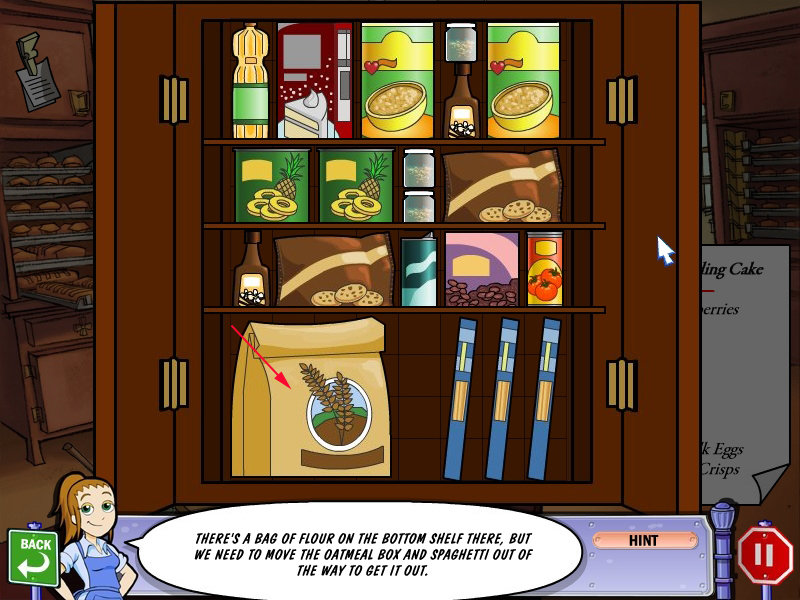 I aknowledge FirstPlayGames for trying more and more different game styles for their Diner Town series, and if their goal with this is to bring in more gamers, they have surely done the job. Thank you BigFishGames and FirstPlayGames for releasing such a great game, as well as JayIsGames for reviewing it. 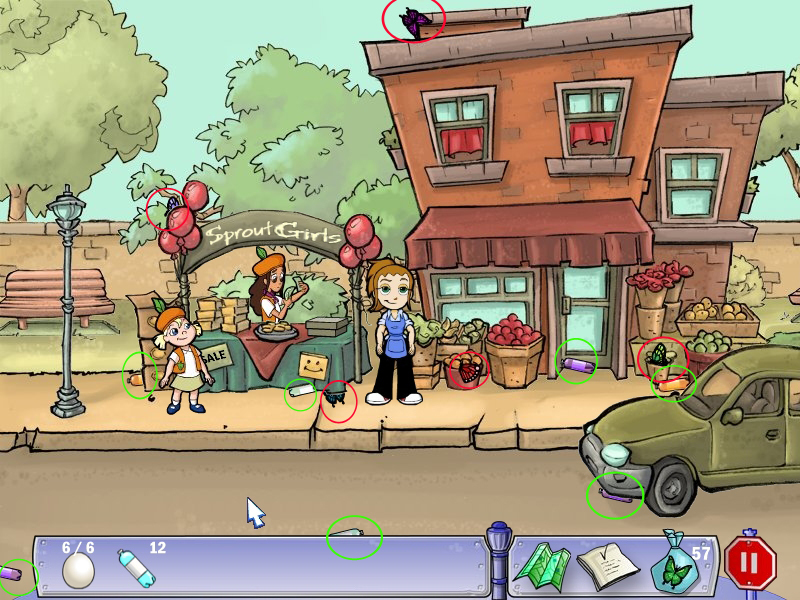 In case you haven't played Avenue Flo yet, then what are you reading this for? 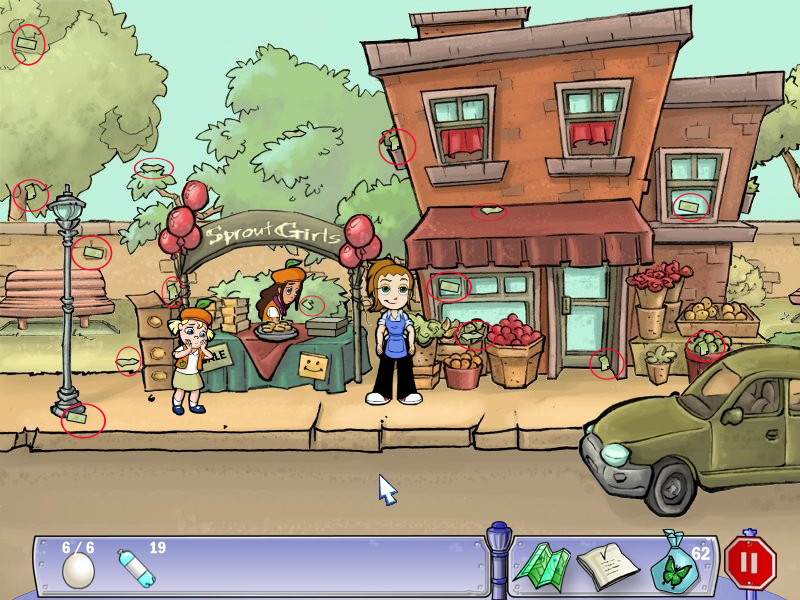 Go ahead and experience the best Diner Town game that FirstPlayGames has to offer. I feel like they chose all the wrong mini-games to put in Activity Mode. Personally I preferred arranging flower bouquets and rearranging groceries in the cabinets of the Yum Yum Bakery to playing Simon Says with chickens and sewing beads in the proper order. This game was way too short. I agree that some of the mini-games chosen for activity mode are a poor choice. The game is fun. 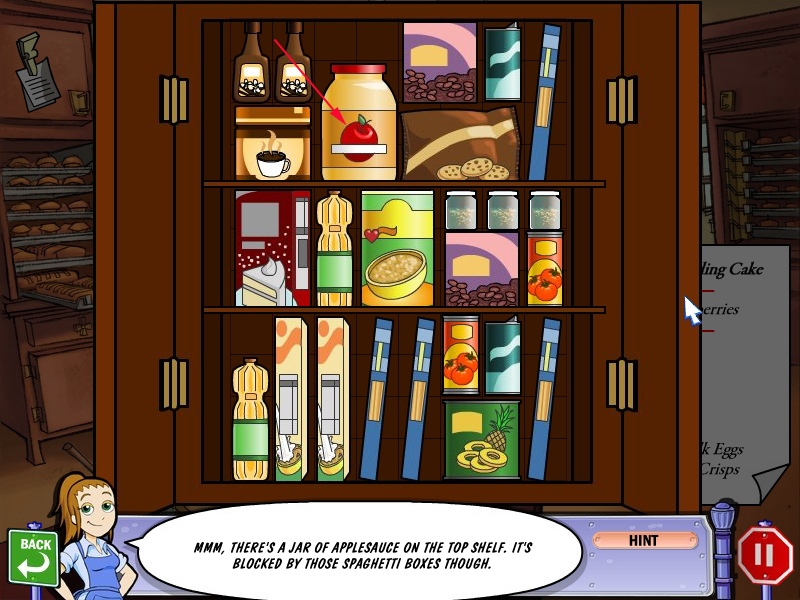 I liked the original Diner Dash, but never played any of the other games in the series longer than the demos. My kids are enjoying this. Some of the puzzles are too complex for them, but since everything is said aloud as well as in writing, they're having fun trying. I, too, would have liked to see more of a selection on the action mode. What is the construction worker's name who said you needed a permit? What is the name of the news stand in your neighborhood? What is the name of the bookworm who runs the newsstand? What is the name of the street that leads to the cruise ship? In what daytime drama did Simon the celebrity just get a role? 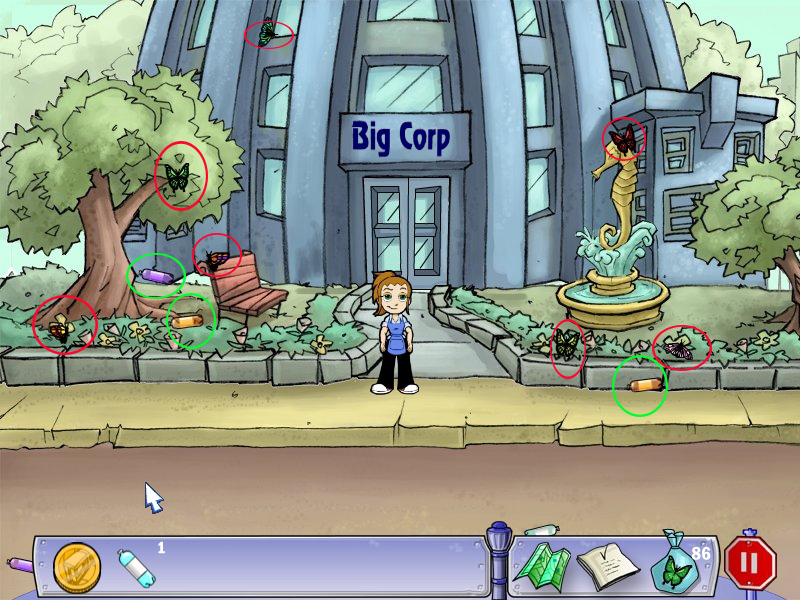 What is the creature in front of Big Corp Tower? Which of these items is NOT in front of the Nautical Shop? 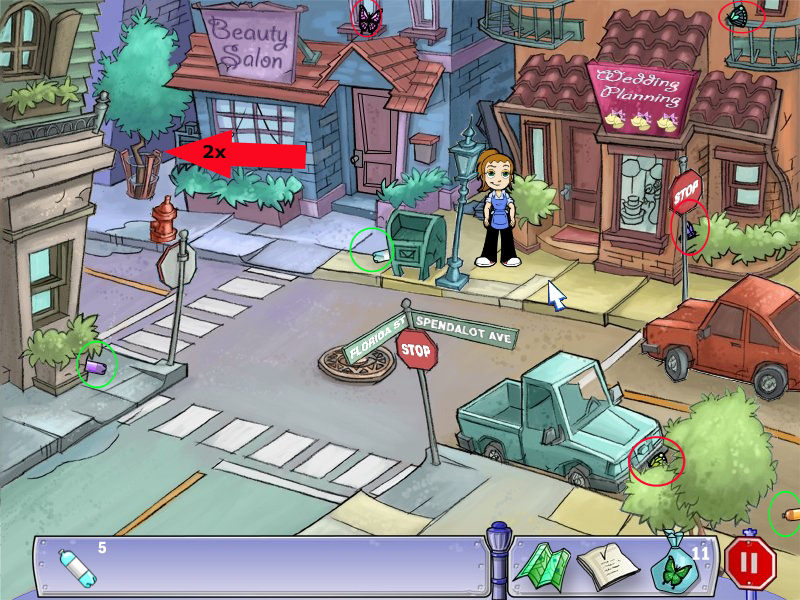 What animal is on the sign of the building located to the right of Marco's Flower Shop? First I have to say: I love this game and I love JiG! We just added a walkthrough on top of the comments :) - All codes you need, you will find there. When you need any further help, please let me know :). Hey! I'm currently playing the bouquet game now. but, i cant get pass the fourth bouquet rules. 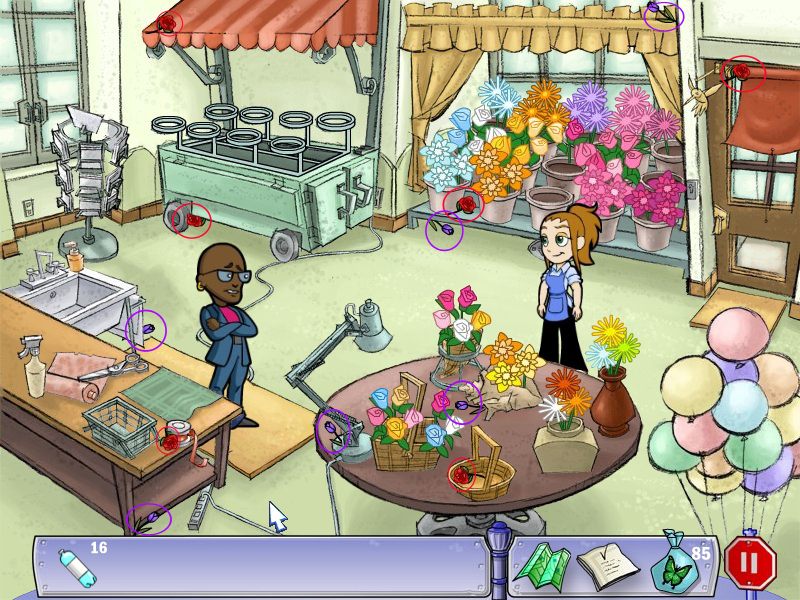 Please have a look at the walkthrough above - you will find a screenshot for all bouquets. hi...i can't go on with the game...!!!!!!!!!!!!!!!!!!!!!!!!!!!!!!!!!! i don't know what to do at the 3° level with the signature card...how can i get them signed, and take the pass from the corporation to go to flo's hause?????? i hope somebody can understand me also with my bad english...i'm an italian girl..!! You need to go into the office on the right and search the maze for five people to sign the card. Check out the walkthrough for more details. i just finished the game!!! it's so cool..i hope they create another game like this in future!!!!! This game is a pleasant diversion. The puzzles really make you think, & the minigames are challenging. The only problem is that if you're not a fan of the Diner Dash games (like me), you might not find the characters so compelling. 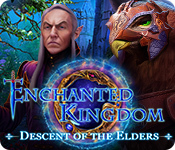 Even so, it's a pleasant title whether you're a longtime fan or a newcomer wanting a good adventure game. Please make sure, that you did everything else before - if there is something missing, Tina does not ask you. 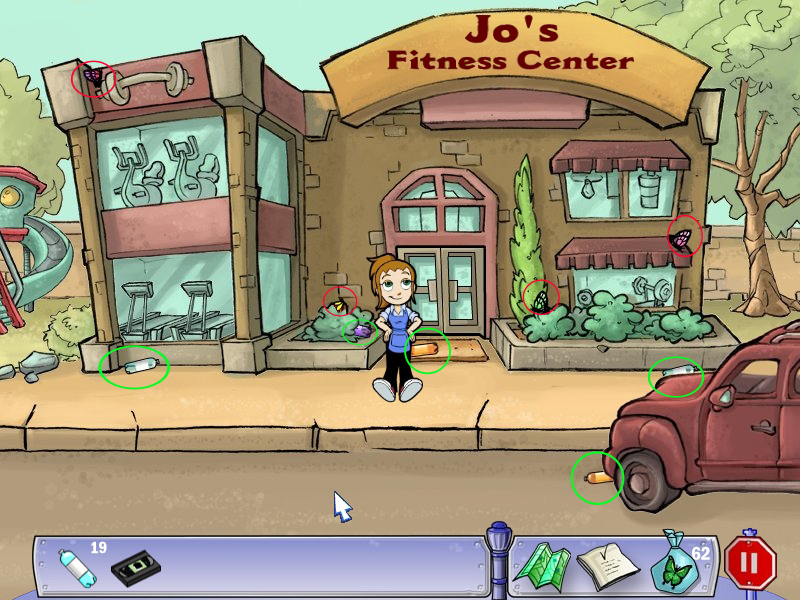 Are there any cheats to get past the last workout routine in Jo Jo's Gym? Where is the invisible ink pen for the safe code combination? Hi. Where is Flo's house in the game? i need help finding the last two butterflies in the first town. Please have a look at the walkthrough on top of these comments. You will find a screenshot including the places of all beads. i don't find the KEY for DESK DRAWER in Flo's House. where is it?? Please have a look at the walkthrough on top of these comments - you will find help in word and picture there :). Thank you so much for the help , i found the last bead thanks to you :). I'm not quite sure, what you mean with "activity mode games"
Didn't you find help in our walkthrough on top of these comments? With what part do you need help with? Well, the walkthrough did help with Adventure Mode although I didn't have much trouble with that. 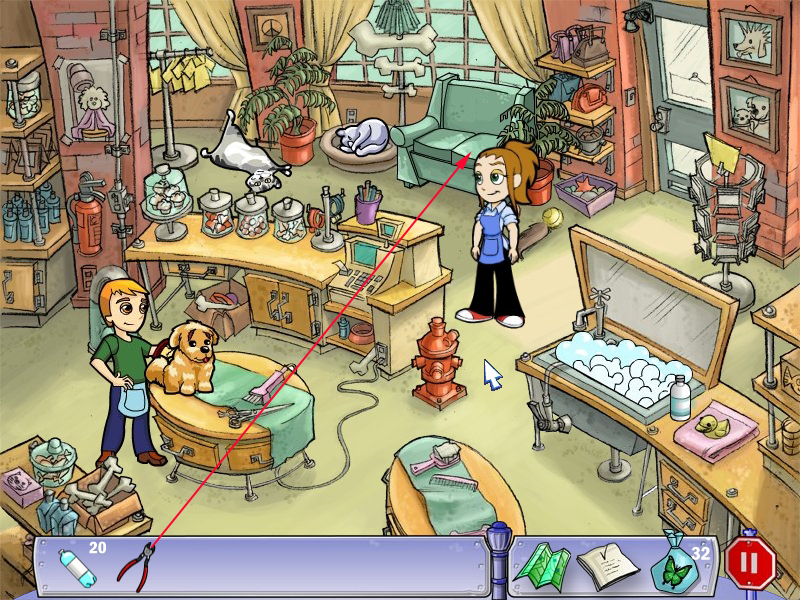 The game also has an activity mode option which includes the bead machine, clothing display, pet supply puzzle, chicken search, chicken chorus, and dough ball rolling. Each of these activities has 16 levels to complete. I'm trying to earn all of the badges for these as well and I actually did get through most of them except for chicken chorus and dough ball rolling activities which I need help with. Ah, ok. I understand. I never played that mode. 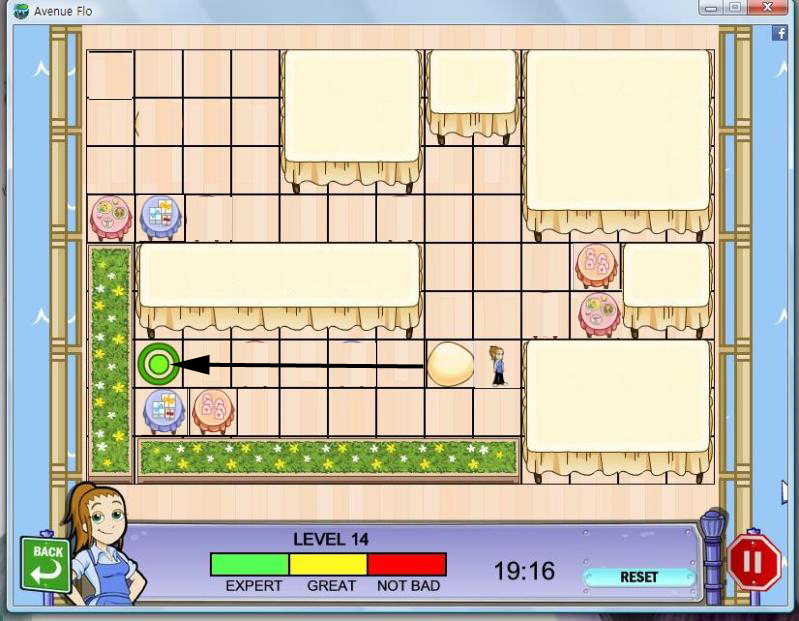 Dough ball rolling -that was the game where you have to find your way by moving stuff, isn't it? Maybe you can provide a screenshot and I will have a look at it? Would it help? :)) You are welcome and congrats!! It's always a great feeling to finish a game completely! Hi, im playing the money game for the little girls right now in yum yum square, i got up to 280.00 could you tell me where the last one is? and where everything should be rearanged in the kitchen? please.. Please have a look at the top of these comments. 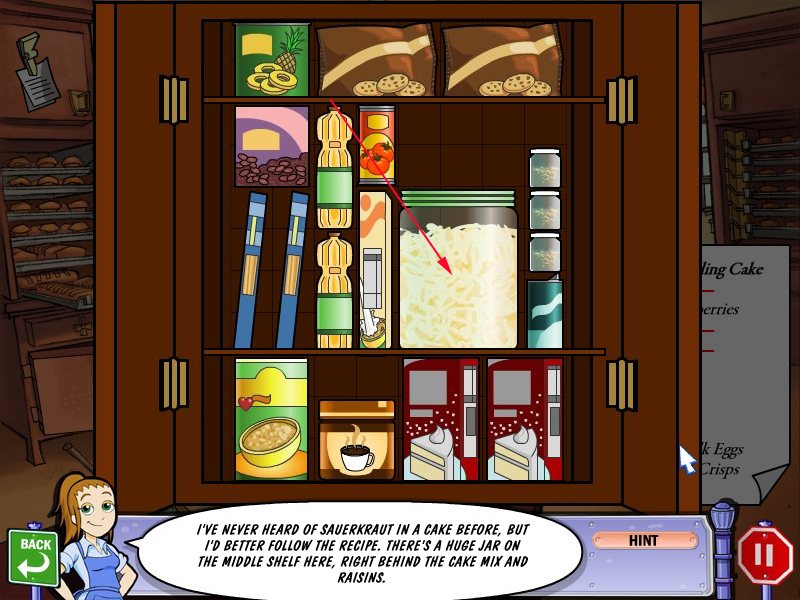 You will find there a walkthrough including screenshots to help you with both of you problems. Did you already have a look at the walkthrough on top of these comments? When you can't find help there, please come back here and we will be glad to help you. 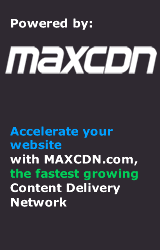 Please have a look at our walkthrough on top of these comments. You will find the solution and the way to it - screenshots are giving additional help when needed. okay i played this whole game without usin a cheat sheet! but im on the level were flo has to find the demo and i got 9/10 and i keep searchin for the last one and i dnt see it! and i dont quiet understand yewr directions! could yew help? I'm having a problem on the The Sprout Girls scene. The last 20 dollar bill i have to pick up is behind the little girl in the bushes. I can not click on it no matter how many times i try. Please tell me what am I doind wrong. HELPPPPPPPPP!!! Can anybody help me I am stuck with the aerobics game? Please help me. "The code for the baking machine is 1122332211"
You also might be able to go back and click the VCR again? 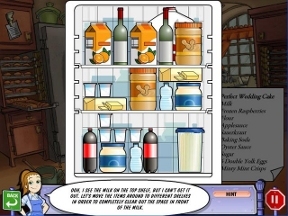 I am stuck in the first part of the game i have found 19 bottles to get on the subway but i need 20 where in the world is the last one i have looked everywhere i cant go any further till i find that bottle can anyone help me locate it. it would be apprecite it. I am enjoying playing the game, but I can't find the last bottle or ballon. Help! I can only find 19 bottles and have been over and over the neighborhood looking for it. I see 2 other people have had the same problem but no answers. Now the game is worthless to me. I almost completed the first puzzle box but no matter how hard I try I can't do it. HELP!!! Have a look at the walkthrough posted above the comments for some help.